Discover the secret legacy of Nikola Tesla. 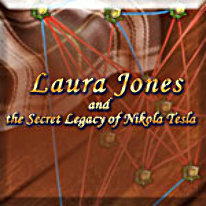 In Laura Jones and the Secret Legacy of Nikola Tesla, young Laura Jones receives a mysterious box left to her grandmother by scholar and inventor Nikola Tesla, with whom her grandmother worked with during her youth. The box contains clues to the locations of the part needed to start Tesla's greatest invention, the location of which is also unknown, but promises to rid the world of its energy problems. Unfortunately, energy is big business and Laura's not the only one trying to find and start Tesla's invention. It's a race against time in Laura Jones and the Legacy of Nikola Tesla, a fantastic prequel to Laura Jones and the Gates of Good and Evil!